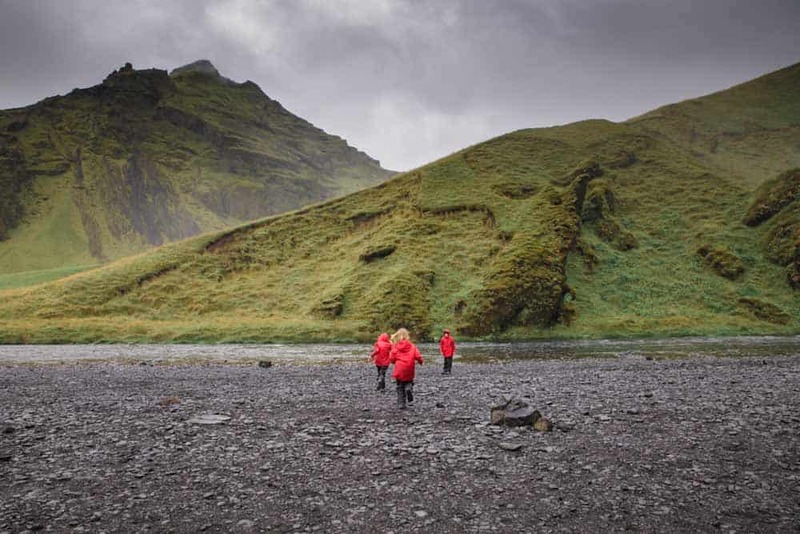 An Iceland family vacation may not be the first thing you are thinking of when you plan a family vacation. 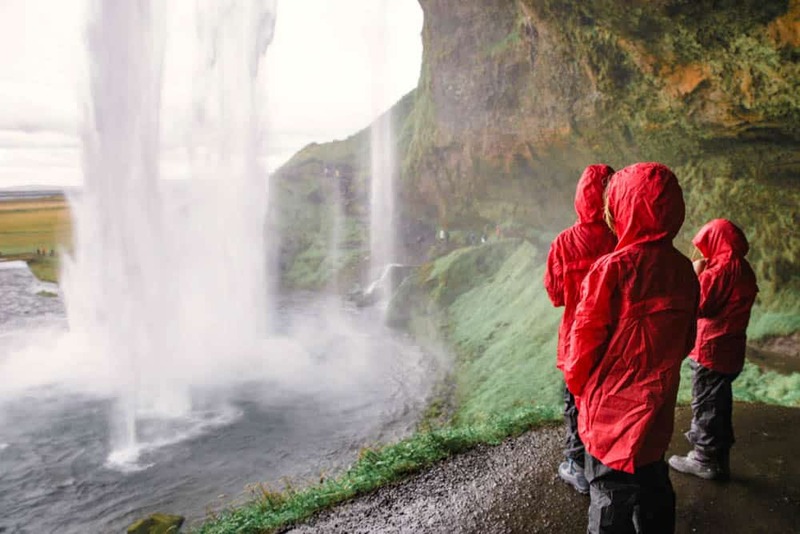 After our recent adventure around Iceland’s Ring Road, we can assure you though that there are plenty of things to do in Iceland with kids. Known as one of the most expensive nations to travel too, a campervan is a great way to cut costs and make the most of this stunning country. 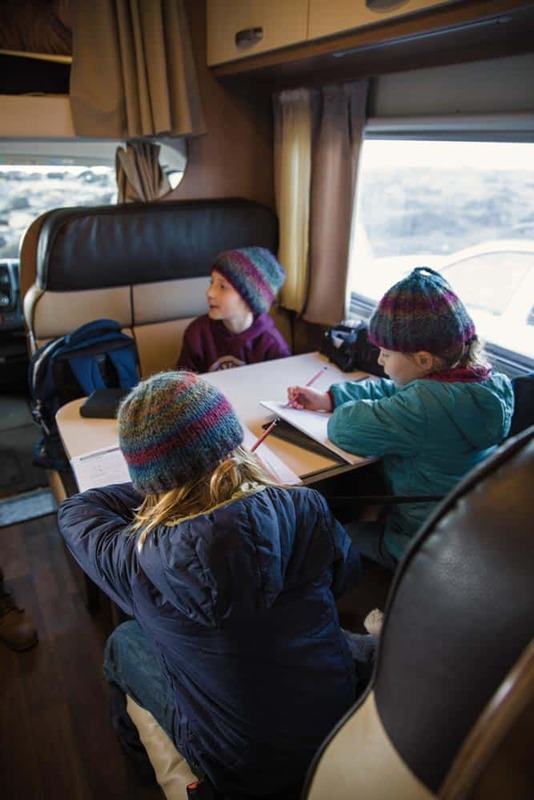 Here are our 7 tips to making the most of your Iceland family vacation in a campervan. 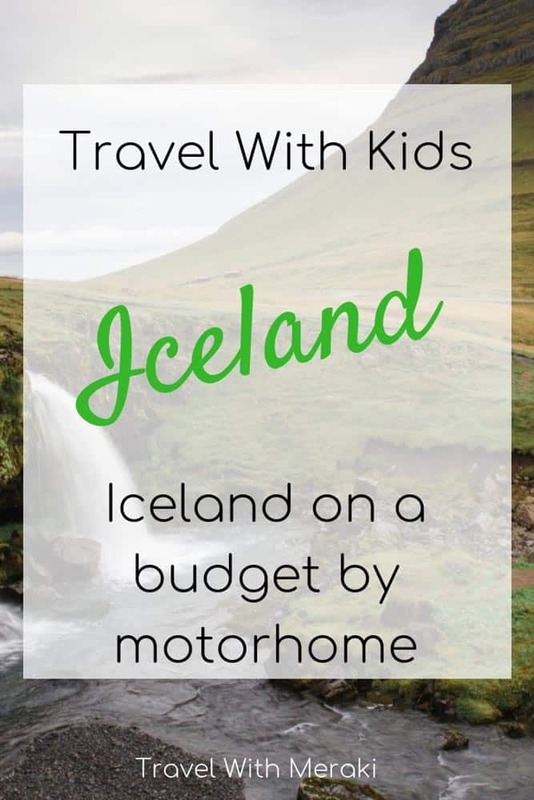 The idea of a cheap campervan in Iceland is probably a stretch for family travel. However, a great way to save a tonne of money is to plan your trip well in advance. 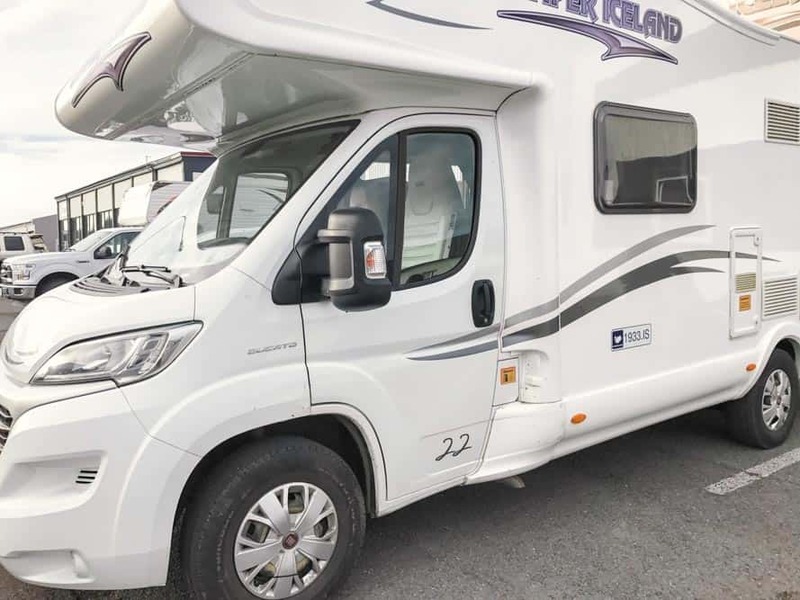 To get a cheap RV rental Iceland, book as soon as you know your dates. Campervans book out fast, months in advance and with a few kids in tow, you will need a larger van. This are limited in Iceland. When you book be sure to consider the size of your van. While it may be cheaper to downsize, will this affect your holiday? We spent 10 days driving the Ring Road. If we had to pack up beds every day and shuffle luggage etc, I am pretty sure we would have got fed up of that routine very quickly. Our van was also set up so the children got to sit around the dining table while we travelled. This was great for long road trips ( which there was a few of ) as they could do activity books, eat and play easily. This one happened by chance for us. Our campervan was in an accident the day before we arrived ( see tip 6!) and by luck, they got us another camper van. Just a day later than our initial plan. Our first day planned was the Golden Circle so we decided to rent a car for the day after hearing about our motorhome. I count this as a real blessing. 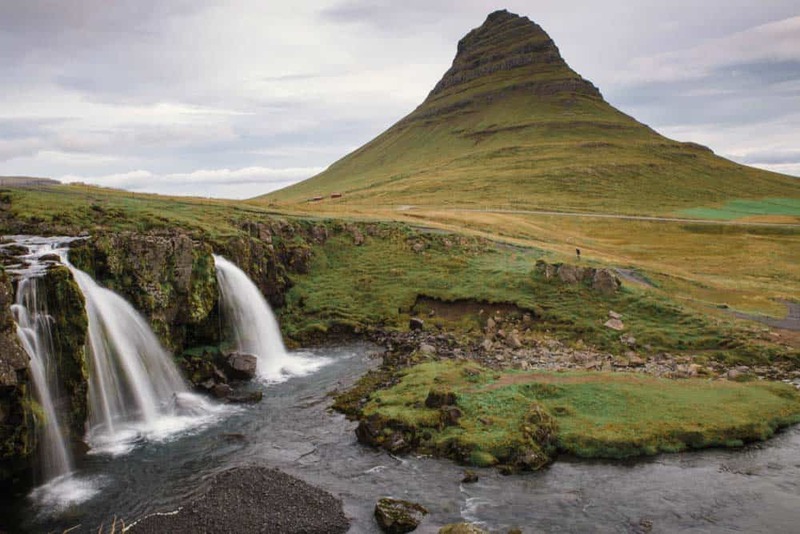 Find car rental prices for Iceland during your trip by clicking here. Although we visited near the end of the main tourist season, in September, the crowds were pretty big in most of the popular sites. Especially Geyser and Gullfoss. The car parks were full of tour buses and lots of cars. To try and park a huge campervan in those places would have taken a while and caused some stressful moments! 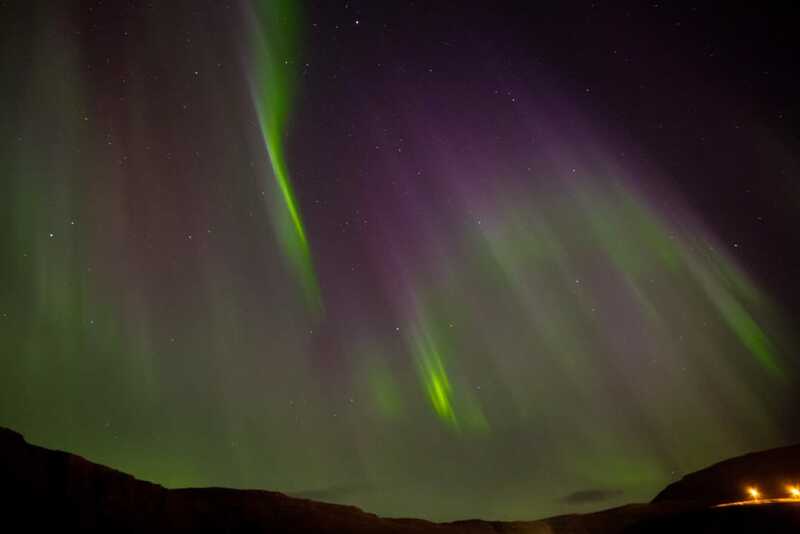 One option is to spend a night in the capital of Iceland, Reykjavik and hire a car. 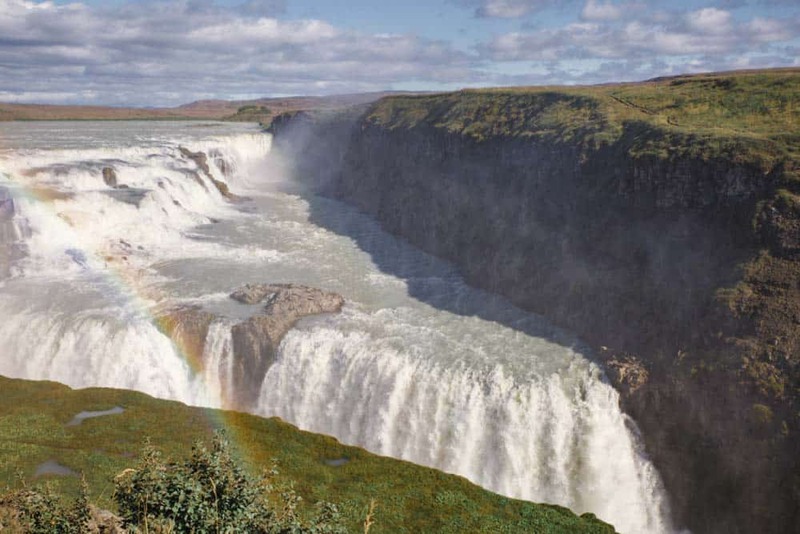 Then visit the Golden Circle from there before picking up your campervan the next day. 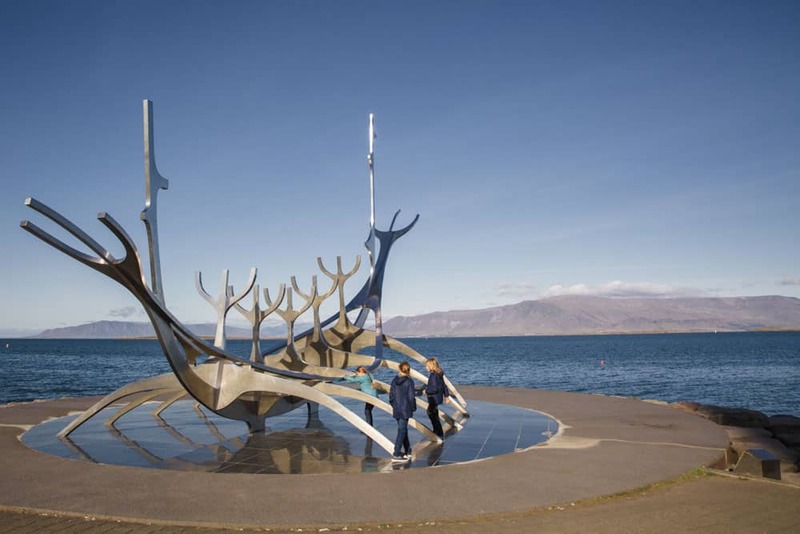 For fun things to do in Reykjavik with kids, check out this post from Kids and Compass. 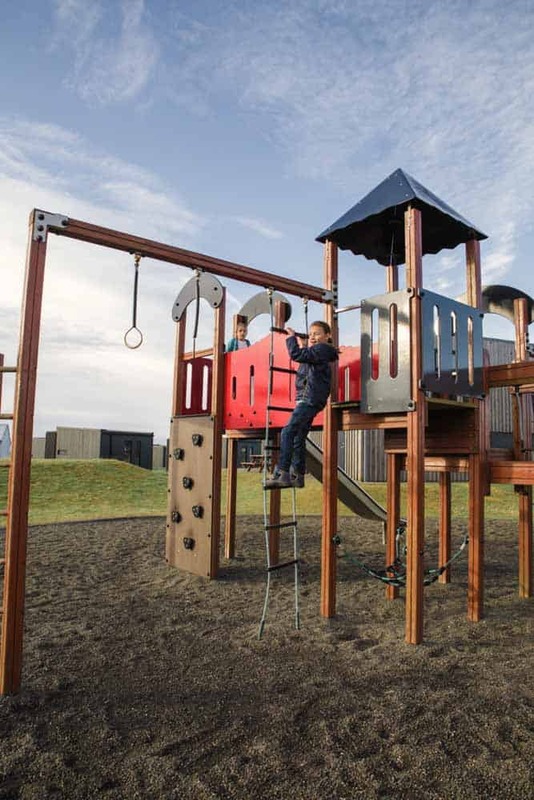 Click here to look Up Great Family Accommodation In Reykjavik. Like most things in Iceland, food is expensive. For us to eat out as a family of five would have been well above our budget. Instead, we took full advantage of motorhome camping in Iceland and had plenty of prep easy meals we could cook in the van. Make one of your first stops in the campervan to a budget grocery store like Bónus or Krónan. Then stock up on essentials. Most of the larger towns will have either one or both of these stores but don’t expect to see any in the smaller towns. We bought plenty of non-perishable items that would fill everyone up cheaply. Things like oats for breakfast and pasta for dinner. And as always when traveling with kids, lots of snacks. Remember room is pretty limited in the camper van so go for meals that don’t take much prep. Meat is extremely expensive. We found sausages to be a good choice as there were plenty of flavors and they pepped up a pasta meal. We also decided on frozen veggies as a cheap and healthy alternative to fresh as we didn’t know when we would stock up again. Be sure to try some of the local tastes like the delicious skyr which is a traditional Icelandic yogurt. Another traditional meal is the hotdog. They are one of the cheapest options for eating out. You will find them everywhere and they are delicious. Do not buy bottled water. Icelandic water is some of the cleanest on the planet so you can refill water bottles at campsites safely. There are so many amazing sites to see in Iceland it can be hard to resist trying to squeeze them all in. Our advice would be to choose the sites you simply cannot miss and make an itinerary which includes your campsites ahead. 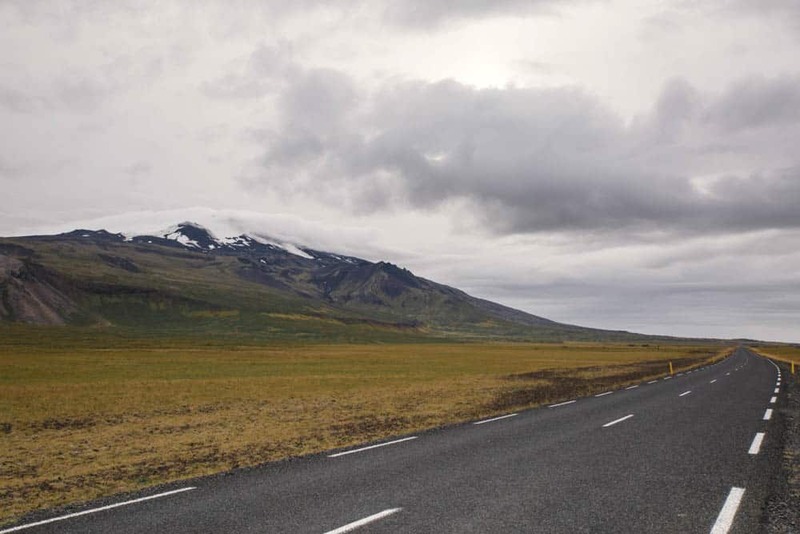 Driving in Iceland can sometimes take longer than expected due to road conditions. Also factor in that you will want to stop every few minutes to soak in the scenery. After many years of travel with kids we have finally learned that less is more. Trying to fit too much in one day just ends in overtired children, cranky parents, and no fun. Make sure you make stops to let the children run free, there are plenty to choose from. We love this post on Reykavik with kids, it’s full of great activities that both adults and kids will love. It’s also got lots of helpful info to help you plan what to see and do in this gorgeous city. 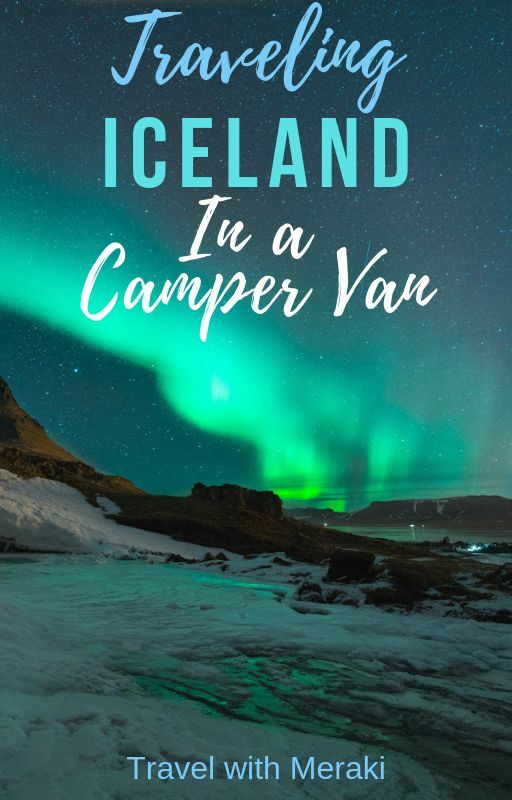 There are plenty of campervan campsites in Iceland. We chose campsites that were well equipped. A few even had playgrounds. You won’t need to book ahead unless you are hitting peak season at a busy spot. However, knowing where you will stop for the night is always a good idea. Where to Camp In Iceland? Click here to find campsites. A great road map of Iceland is also essential. Not only will this work even when your wifi doesn’t, but it will also give you road conditions ( Campervans are not allowed on F-roads in Iceland), gas stations, where to camp and places of interest. We found this Iceland National Geographic Adventure Map to be fantastic. Note on Free Camping Iceland: If you are in a motorized vehicle it is illegal to free camp in Iceland. For us, camping in paid sites is also a way to give back to the country we visit. Spending money as a tourist is how a country thrives on tourism. We opted for bedding and towels as we try to pack as light as we can and didn’t want to lug sleeping bags etc. The nights can get very chilly so it is vital to have warm bedding, even with a heater we were thankful for cozy quilts. An inverter was another big must for us. Like most families, we travel with plenty of electronics. You will want to charge cameras, iPads, and phones ( I also travel with a power board so we can charge these all at once). We also opted for an outdoor dining setting which can give you a break from too much van time. Our biggest lifesaver was a coffee machine. For $20 it was so nice to have a delicious coffee every morning. 25 of our favorite travel families share what to pack for a family vacation. Did I mention our original camper van was totaled in an accident before we arrived? We always get travel insurance for any of our adventures which I would strongly recommend anyway but for your campervan, it is a must. Iceland has some serious wind! We heard stories of doors been bent backward. It was so strong on one day even us adults found it hard to walk against it. As a side note, it’s a good idea to not let children open or hold doors at all in Iceland so that you get into the habit of doing it for them. Sheep also seem to roam freely. We saw a few close calls with other drivers when the animals wandered onto the roads. Another issue is a lot of carparks and even some roads are gravel. To prevent any nasty bills and stress make sure you get insurance. Always read all your small print on your rental agreement too. In such a small space it is easy to get overwhelmed and then the campervan turns into a war zone. Have systems in place and jobs for everyone. It is a great way to make sure nothing gets forgotten and everything has a place. Simple things like everyone having a job each morning. From making sure the toothbrushes are packed away ( we had ours flying around the van at one stage ) to turning off the gas bottle. Also have a specific spot for things like flashlights, children’s wet weather clothes and P.J’s. This will make van life much more bearable. 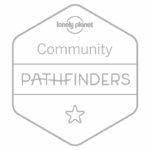 Click here to read Family Off Duty’s, Campervan beginners guide. Should I Hire A Campervan in Iceland with Children? I always knew Iceland was beautiful from the images I had seen. To see it in real life blew us away. Our children have so many magic memories from this trip to Europe and constantly talk about going to underground volcano caves or walking behind waterfalls. In all honesty, we would never have been able to afford this trip if we had not decided on camping van rental in Iceland. It made our trip much more affordable. I also think that staying at campsites also allowed us the opportunity to make more of the scenery. On two nights we even got to step straight outside our camper van and experience the Northern Lights. Magic! Loving the idea of campervan holidays with your family? We love real stories of families travels. Click here to read about Abottses trip to Iceland. Travel With Meraki. Please show respect when visiting a country. If there are signs protecting local flora, don’t stomp on it to get a good photo for Instagram. On our travels, we discovered plenty of evidence of people destroying the environment through throwing litter and being in areas they shouldn’t be. Teach your children to admire the places they visit and to leave it as they found it. Help to protect beautiful places like Iceland for many years to come. What a fantastic article!! On my bucketlist! Thanks so much April. I hope you do get to explore one day. There is so much to do and see.